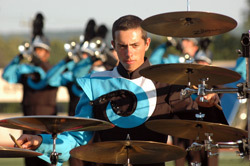 The Jersey Surf, celebrating its nineteenth anniversary in the coming year, is a nine-time Drum Corps International Open Class Finalist (formerly Div. II & III) and has been recognized with the "Spirit of Disney Award" three times in the last six years. Most recently, the corps was a bronze medalist at the 2008 Open Class World Championship in Bloomington, Ind., following a silver medal finish at the 2007 World Championships in Pasadena, Calif.
"Today is certainly another monumental milestone in the continuing evolution of our organization," said Jersey Surf executive director Bob Jacobs. "We've worked hard over the past 18 years to develop an organization that provides its members, staff and volunteers with an exceptional drum corps experience, and we will continue to develop and refine the program to that end." The vote to accept the corps into the World Class is the culmination of an evaluation process which began in the summer of 2007, involving an intensive review of corps operations, and an ongoing dialogue between corps administration and the DCI Board of Directors. 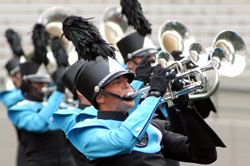 The Jersey Surf will continue to follow a more limited "regional touring" model which Jacobs says will allow the organization to provide an alternative to high school and college students who might not be able to participate in a World Class corps that travels more extensively. "Our board of directors, administration, instructional staff, volunteers and alumni are very grateful to the DCI Participation Review Committee for their assistance and guidance during this process, and to the DCI Board of Directors for their unanimous vote of confidence," said Jacobs. "We are extremely proud to move into the ranks of the world's most highly regarded and respected drum corps, and we're looking forward to having the opportunity for our members to perform on the World Class stage." Also during the scheduled meeting of World Class corps directors was the approval of a streamlined organizational governance process originally voted on in January of 2008. The change was made official during the Tuesday evening conference call with unanimous endorsement of a ratified set of by-laws.